Since we had the builder converted an extra bedroom for our dressing room, we deleted the walk-in closet in our bedroom. Our room essentially became a big rectangle, within which we were able to create a large sitting area. The generous wall space gave us lots of furniture placement options, so much so that all options seemed viable, and our pondering process once again took over us. You saw the projects that kept the Mr. occupied during this time. It was only natural that we once again left our own bedroom untouched before we moved again! Today, I'm sharing with you some layouts and mood boards that I've created from my Pinterest inspirations. With our room being a rectangle, we had the option to put our bed near the window wall (left side of the room, which was how we had it) or at the other end of the wall (right side). With our bed near the window wall, the empty designated sitting area became the little man's hotwheels test drive area and beyblades arena. If I wanted to reclaim that area, all I had to do was create a small living room. I was also inspired by this photo, and wanted to incorporate a mantel at the wall between the two windows. Here is our bedroom's design and layout board using the floor plan as a background. Main colour would be beige/ cream, with accent colours in warm undertones such as bluish grey, mauve, and earth colours. Sources: colour inspiration via Valspar; sitting area source unknown; fireplace inspiration via Tradition Home; chandelier and medallion rug via RH baby and child; floral motif rug via Joss & Main; chaise via Horchow. It has been our plan for the longest time to go with this option, until the Mr. threw a curve ball and suggested putting the bed on the right side of the room. Leaving the fireplace between the two windows, and we would have a mini family room. He tried to entice me to this idea with a vanity table. I'm always open to new ideas, and a beautiful vanity table, so I gave him this design option. One would be greeted with a sensual vibe of the master bedroom, with the vanity table beside the window at the entrance's direct sight line. Two inviting armchairs flanking the fireplace, with a coffee table in gold tone finish, would set the focal point of the room. I would incorporate a dresser beside the window for more storage (yeah!) and a beautiful vignette. This design would even out the space, with a simpler sitting area. Sources: console table via Vogue; gilded bench via Elte; vanity table via Architectural Digest; tufted arm chairs via Anthropologie; coffee table via wellappointedhouse.com. After the Mr. accomplished his masterpiece in the office, he sprung another design option for our master bedroom's sitting area. He said the office's built-in was a practice run for our master bedroom's built-in... I think he was trying to sneak in a TV at the built-in unit to challenge my "no TV in the bedroom" rule. To satisfy his curiosity, I re-jigged the sitting area by putting in a comfy couch in place of the two armchairs. Afterall, we would need seating appropriate for lounging if there's a TV! I also excluded a fireplace, otherwise the left side of the room would look too heavy with too many chunky pieces. 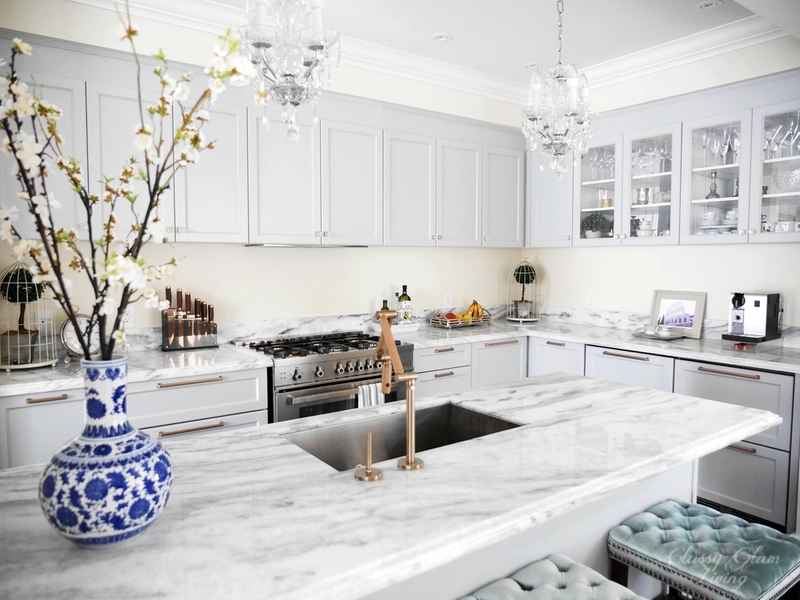 I think a similar setting as in the sitting area inspiration below would look ultra-glam! Sources: wall unit via One Kings Lane; sitting area via New England Home. Our master bedroom in the new townhouse will have a small sitting area, and we've already gone through several different designs of that space. 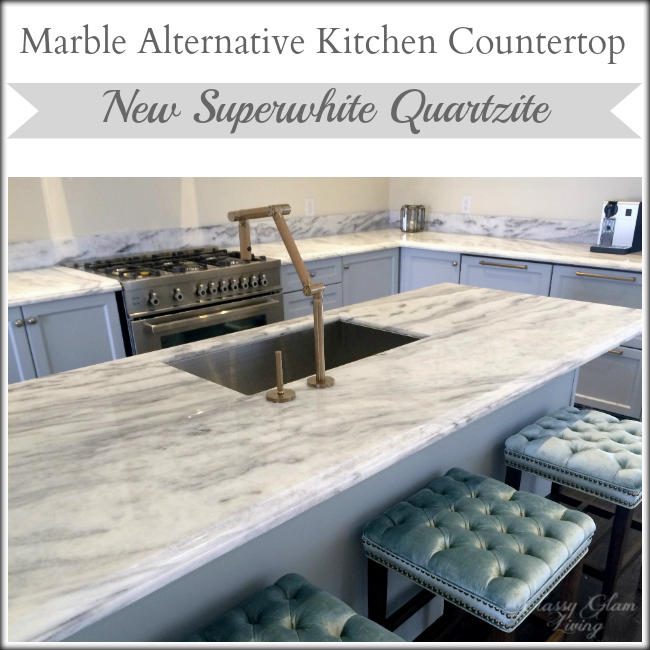 We want to maximize its wow factor and also make it look roomy in a small space. Let's just hope this time around there'll be less pondering, so that our bedroom won't be undecorated before we move again! Even though we've moved out of our old house, we've been going back to clean it. It's only right to hand over the house to the buyers in a truly move-in ready (clean) condition... and just another excuse for us to linger more until closing. As the Mr. and I walked into the empty house, we still couldn't help but fall for the abundance of light that pour in from the patio doors to the living/ dining room. The sitting area was another space that we have yet to tackle before we sold the house. We staged it with two armchairs that we got for the family room, so that it didn't appear too empty for the property listing photos. Do you see a common theme going on in these 3 images? What we were looking for was a settee, a small accent table, and a piece of wall accent. We wouldn't be able to fit a coffee table in front of the settee, since that would block the path to the patio door. Its simple lines is a contrast to the tufting on our dining chairs. We also loved the welcoming feel of those curved sides, as if those arms are hugging the person sitting on it. Sources: 1. & 2. One Kings Lane; 3. & 4. Joss and Main. We ruled out the pedestal tables like 2 and 3, since our dining table is already quite chunky-looking. An accent table with skinnier legs would give the area a more open feeling. If I had the time, I would've started on my living room DIY art project. I even had the poster size of this Plan de Turgot map printed! To complete the living room's sitting area, we would add a lightly patterned area rug and a gorgeous chandelier for some sparkles. Sources: Rug and chandelier - Joss and Main. Nope, we're not done yet! There was still the opposite side of the room. We went through different design concepts for that area, one of which included a faux fireplace (just a mantle) with two armchairs in front. In the end, we decided to just keep the area less populated. Otherwise the left side of the room would look way too crowded, with the dining table in front of it, creating an imbalance against the simple sitting area. The Mr. and I enjoy the occasional drink at night, and the left side of the sitting area would've been a great spot for a bar cart. As I kept searching, the styles got all the more vintagey. I wasn't sure if I would want to start adding antique pieces to our decor. Choices 1 and 2 were on the vintagey side, and I came to realize that I was looking for something a bit wider than a regular cart. Choices 3 and 4 were of a more contemporary style, and we would've chosen #4 for its size and also the higher edge around the shelves for its added details. Still not very convinced about how the chrome and modern flare would go with our existing pieces, I kept searching and came about a console table that was narrower in depth than bar carts. That would be great to free up some space between the bar and sitting areas. 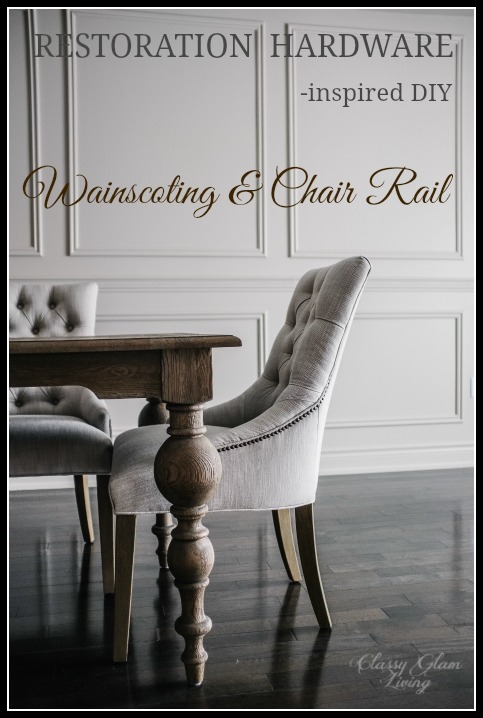 Simple tapered legs in antiqued gold finish would blend in with the wall, while picking up the wainscoting details. While we were at ZGallerie during our Chicago trip, we found some pieces that would've made our bar area come alive! These bar essentials are but a few statement pieces that we would love to incorporate on the console table. Can you imagine how much time we spent at the store that day? We also roamed through the art collections there! We found a piece that would pull all the colours in the living/ dining room together, while adding a totally different colour. This painting isn't a dining related piece of art, but it's pleasing to look at with the soft colours. The cream and khaki colours mimic our wall colour, while the blues and greens are of a similar tone as the blue-green in our draperies. The deep pink serves to bring out the bar area as a focal point as you walk in from the dining room, or sit on the body-hugging settee from across the room. While I was searching for the bar area armchair, something else caught my eyes. Of course, I would need a small accent table on which the Mr. can put down his drink also! A little garden stool adds a little casual vibe to the room, and a darker coloured piece would ground the setting. This is the view of the back of the living/ dining room as one would come through from the dining room entrance. I think this would've been the best use of space for us, keeping everything simple yet practical. If we needed more seating there, we could easily grab a dining chair from the adjacent dining area. The Mr. looked impressed as I showed him this design board. We've always talked about our design plan for the living room, but this is the first time that we've actually seen it "come to life". Our new townhouse's living room would be a longer horizontal space. I have been gathering furniture placement ideas and curating potential furniture pieces on my Pinterest board. Check out my living room Pinterest board to get a glimpse of our furniture placement ideas for the new living room! Remember to check back for another set of "Would've-Could've" series! We've settled in nicely into our rental townhouse, albeit some hickups with power outage and dealing with a non-functioning air conditioning unit thereafter. Thank goodness it was fixed within a day, and the weather was cool enough to be without it for a bit! The Mr. was nice enough to let me take the entire master bedroom's walk-in closet, while he took the single closet in the 3rd bedroom (aka his new dressing room/ laundry sorter and drying room). He has an extra clothing rack in that room as well. Kinda squished there! Gone are the days where we could stretch out our arms to fill in our sleeves and hop around as we put on our bottoms without bumping into walls or doors. No biggie, we'll just need to fine tune our balancing finesse! Of course, that brings me to reminisce about our dressing room. As promised, this is the first of the "Would've/ Could've" series, which will run for the rest of August. As in, if we would've stayed at our previous house, how we could've decorated the rooms. Love the nailhead details in the valence of the window treatment below, but the whole look seemed a bit too busy for the dressing room. The treatment below has a dreamy look and it's the ultimate in softness. However, I think the Mr. would prefer something less fussy, minus the puddling look. Never thought that I would like the ballooning valence style, but it's nice and elegant in this space. No dressing room is complete without some kind of seating. Afterall, who wants to hop around single-legged while putting on pants or socks? Getting small stools for each of us was on my to-do list, but we got a bench instead. 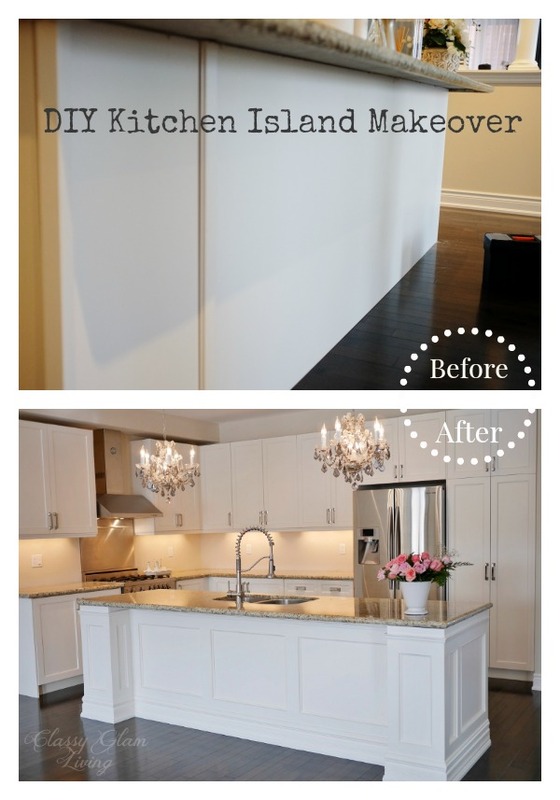 It was fine when we didn't have the island, but it would've taken up too much space if the Mr. had gotten around to finish installing the island. So I was still searching for smaller seats in case the Mr. was ready to jump on another project again, once he was off of the break he took after the office cabinet project. Sources: 1 via Horchow; 2, 3, and 4 via One Kings Lane. I loved choices 1 and 2 for its feminine flare, however, I had to consider the fact that I shared the dressing room with the Mr. Not that he would've minded, but I also loved choices 3 and 4 for their more contemporary style, with the separated seat cushion look. Ultimately, I would've chosen #4, to inject some colour contrast into the room and balance the light-coloured wardrobes and island. 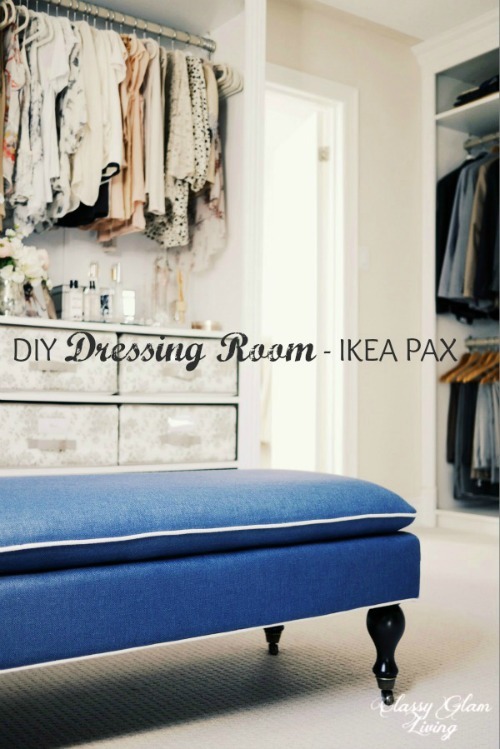 To up the luxurious feel of the dressing room, a fluffy rug would've felt nice and soft against bare feet. However, we already have broadloom in the dressing room... so forget about a fluffy area rug. But these sheepskin rugs from IKEA are bang for the buck and would've been so heavenly, pleasing to the eyes and under our feet! If we had the wallspace, I would've loved to incorporate some pieces of art into the dressing room. Sorry again for making our dressing room too feminine, but these pieces bring out the sensuous side of the room. With our dressing room's wardrobes being all open and the clothes in plain view, it was already quite colourful. I think I would keep the artwork toned down. I'm loving the gold foil prints that are all the rage these days. These prints of classic perfume bottles would be my choice to bring out the sparkly in the room, while still low-key in a sense that they are monochromatic. Here is how the dressing room would've been decorated by incorporating our design choices above. A calming and luxurious feel, brought about by the mirror top island and the softness of the window treatment and sheepskin rugs. We won't have a dressing room the same size as this one in our new townhouse, but we have made some floor plan changes for a good size... let's call it a dressing area. I will leave that for a future post. 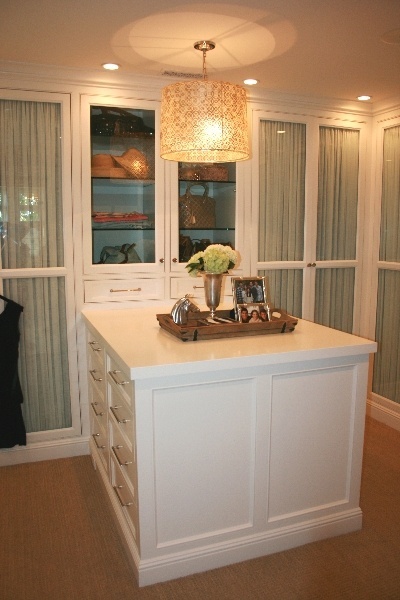 For now, you can check out my Dressing Room Pinterest Board to get a sense of our new dressing area project!